It was in the middle of the night (whilst reading bizarre criminal cases) when I had a sudden craving for dessert. 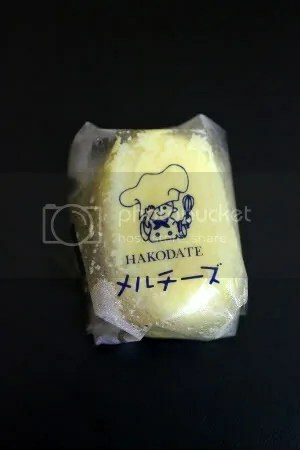 During the day one of the friends passed me a single hakodate maru cheesecake souffle bought from Takashimaya’s Winter Hokkaido Fair. It’s bite-sized and collapses at the slightest touch if it’s not refrigerated. It took quite a lot of effort to transport it home! I’m not a fan of cheese by it’s impossible not to love this soft creamy melt-in-the-mouth dessert. Don’t expect a load of cheesiness in your mouth like those american cheesecakes. It’s light tasting and very refreshing when served chilled from the refrigerator. Totally worth it’s price ($10.50 for 4 according to websites)!